Between managing Facebook, Twitter, LinkedIn, your blog, and your email newsletter, time is tight at work. You don’t have very much space in that schedule for Instagram. And maybe your boss isn’t even convinced yet that the world’s most popular image network can deliver business results. But you are. And you need to find a way to make it work efficiently. Though we would advise dedicating as much time to Instagram as other social networks, we recognize that this just isn’t an option for many people. Whether you’re on a small marketing team or you’re self-employed, you need to budget your time carefully. Which is why we created this post. If you only have 20 minutes a day to manage your Instagram account, this is how we would spend that time. Instagram followers expect consistency. You can’t post a photo today and tomorrow, then not post anything for four days, and still expect your followers to stick around. That’s why it’s important to have a content calendar that includes Instagram. Spend a little bit of time each day looking at your content calendar. If it’s empty, fill your calendar with image ideas/concepts that you’d like to post over the next week. These might include photos you already have and some you will still need to take. If your calendar is already full, see what images you have planned for today and tomorrow. Start thinking about captions and hashtags that might work well with them. Also consider whether these images would perform well if cross-posted to social networks like Facebook and Pinterest, or even embedded on your blog or website. All of these details can be included in your content calendar so you don’t forget. When you don’t have much time to allocate to Instagram, the more work you invest in planning, the less time you have to spend thinking about the details when it comes time to actually post your images. Editing and posting images is, in its essence, what Instagram is all about. You’re sharing images which create a visual identity for you or your brand. You strive to post only the best or most intriguing images in order to appeal to your following and the community at large. Since image editing and sharing is core to the very purpose of Instagram, why have we allocated so little time to it? That comes down to several factors. First, Instagram is extremely intuitive. With the help of preset filters, easy editing tools, tagging and social share buttons, you can build your entire Instagram post in just a few minutes and share it across your network. Second, in addition to Instagram, there are a number of mobile photo editing apps built with Instagram in mind. These apps aren’t just valuable from additions to the Instagram editing suite, they also allow you to bulk edit your photos in advance. This means that, when it comes time to post, you already have the image part of the equation finished. A few minutes spent on the caption and tagging, and you’re good to go. 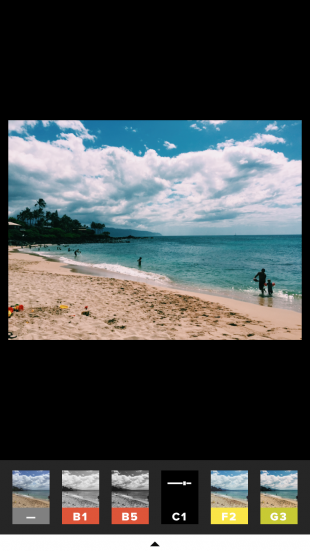 Look into tools like Afterlight and VSCOCam, which are both very popular options in this space. Third, if you only have 20 minutes to spend on Instagram every day, you also need to have realistic expectations of the quality of image you’re looking to share (i.e. you’re not going to be on par with a professional photographer). And that’s okay. The Instagram audience is used to seeing images that look like they were taken on a phone (most are, after all). Oftentimes these images are more relatable than their studio-quality counterparts. People appreciate when a brand posts images that were clearly taken spontaneously on an iPhone and then shared with the world. It’s how most people use Instagram and adds a behind-the-scenes or personal feel that people enjoy coming from a business. So don’t stress out about the quality of the photo as much as you do about the substance of it, which you ideally will have taken care of in the planning stages. Fourth, with Hootsuite’s new Instagram dashboard integration, you can actually build and schedule your Instagram posts in advance. This allows you to allocate time once a week to prepare your images, so you can use the rest of your valuable time engaging each day. Finally, you probably shouldn’t be posting more than one or two photos every day. Even though people have come to appreciate brands on Instagram, they don’t want you to overwhelm their feeds. Don’t treat Instagram like Twitter. In an average day you should strive to post a few high-quality photos at most. Your followers will appreciate the sporadic brand image and this approach will remove any pressure you feel to constantly be churning out content. If you only have 20 minutes to spend on Instagram every day, at least half of your time should be spent on engagement. Engagement, which includes liking and commenting on photos, is how you’re going to earn new followers and strengthen your Instagram community. Unsure of how to engage? Start with your own photos and followers. When people comment on your photos, take the time to respond to them. Thank them for their comments, respond to questions, tell jokes; anything that will show them that you went out of your way to talk to them personally. You can also take some of the people that have liked or commented on your photos, and return the favor by following them and interacting with their photos. Don’t spam them, but like a few photos and leave a comment or two. Having a brand comment on their photo can be a huge ego boost for a regular user. People also want to know that there is a real person behind your feed. This engagement helps you show you’re not a robot, and makes your brand more relatable. These actions will help transform followers into brand advocates, who will help you grow your Instagram community more naturally, supporting your brand and consistently creating buzz around your content. Once you’ve taken care of your own community, look outside of that comfort zone. Use the Explore tab to find new people and photos that are relevant to you and your business. According to Instagram, they choose photos “liked by people whose posts you’ve liked or posts that are liked by a large number of people in the Instagram community.” This is, once again, why it’s so important to be active in liking photos from people in your community. It will result in more relevant images and users appearing in the explore section. Once the Explore tab has surfaced relevant users, engage with their content like you would with one of your followers. You might be surprised at how quickly they follow you back or engage with your content. Not only is Instagram engagement core to building your community, it’s a self-sustaining process. The more you engage, the more engagement your photos will receive, which in turn will increase your chances of appearing in the Explore tab. 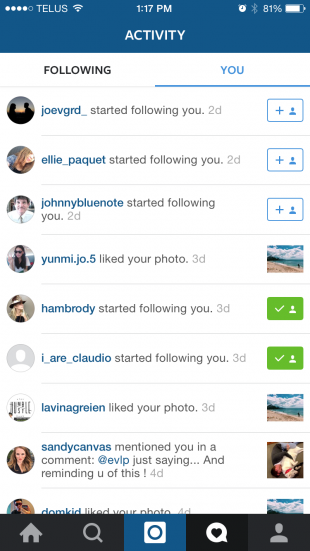 Appearing in the explore tab will result in more followers and engagement, creating a positive feedback loop. 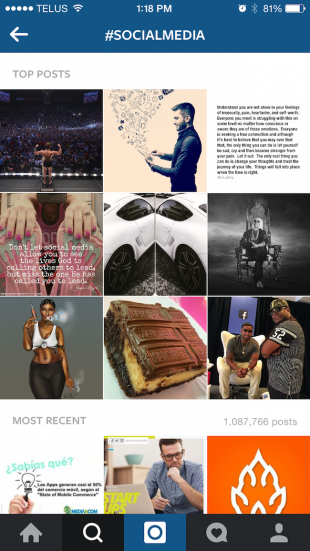 With the rest of your time, look at the hashtags and Instagram communities that matter to your business. This is an opportunity to learn about these users: what photos they like and what photos they share, the hashtags they use, how they write captions and comments, their favorite emojis. Take note of these trends and use them to guide your content strategy on Instagram moving forward. You may also want to consider creating a branded hashtag, or at least taking part in a relevant industry hashtag. Supporting a hashtag in this way, especially a branded hashtag, can create a reliable source of user-generated content. 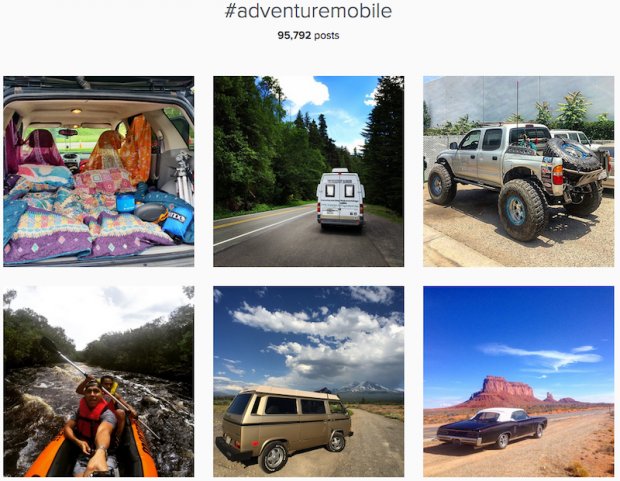 If you ask your followers to contribute their own photos to a campaign, like Herschel Supply Company does with #WellTravelled or Poler Stuff does with #AdventureMobile, you can then identify the best UGC and reshare it (with full credit) with your audience. Your followers will probably appreciate the exposure, while you get a reliable source of content, further decreasing your Instagram workload. Since 20 minutes is a very short period of time, it’s important that you make the most of it. We also wanted to share time-saving tips for Instagram that will help you stick to your 20-minute window. Is there an event at your workplace, like a party or a presentation, that might be a good illustration of your work culture? Do you have a batch of new hires joining the company? Are you moving into a new office or have you improved your facilities? Maybe someone from a partner company or a local business paid you a visit? Recognize that potential in day-to-day work situations, pull out your phone and take a lot of photos. You can sort through them and find the best ones at a later time. The key is to build this repertoire, so you’re never short on content. 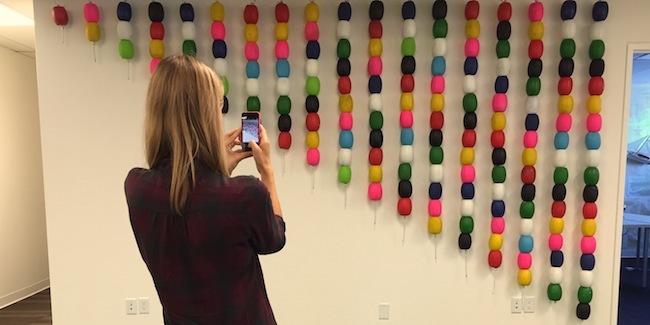 User-generated content can drastically reduce your workload and save you time by providing you with a steady stream of photos to choose from. Put a little extra work into creating a branded hashtag and encouraging your followers to contribute their own photos. This will pay off tenfold down the line, especially on slow weeks when you’re struggling to find content. In addition to UGC, you can also share your workload by encouraging other employees to get involved in your Instagram efforts. Create a company hashtag and ask colleagues to tag (appropriate) work photos with it. You can then reuse these photos on the branded account. As mentioned, setting up a content calendar for your Instagram account will do wonders for keeping things organized, and ultimately keeping you on schedule. At the same time, sticking to a schedule will also benefit your Instagram growth, since followers will know what to expect from you. The last thing you want is to update your account once a day or once a week, and then disappear for weeks. Posting images at specific times every day creates a routine that will keep followers coming back, while also saving you the time you’d spend figuring out when (or even remembering) to send images. When creating a visual identity on Instagram, you should probably stick to one or two filters for your images. Doing so will make your images more recognizable to followers as they scroll through their feeds. Many people aren’t aware that you can actually reorder your Instagram filters to save you time if you reuse the same ones over and over. To do so, start editing a photo. 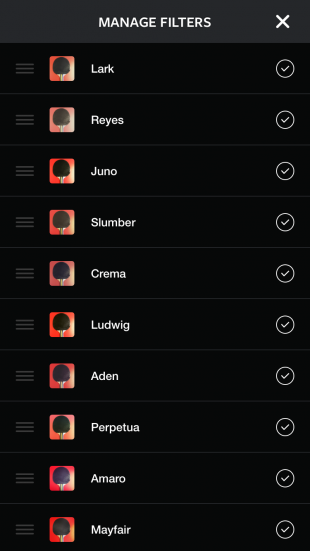 Once on the filters screen, scroll all the way to the end of the list until you see a settings icon. Within the settings menu, uncheck filters you’d like to disable, or reorder filters by dragging and dropping them using the three lines on the left hand side. Then tap the X at the top to save your changes. With so little time to spend on Instagram, you don’t want to spend precious minutes playing catchup. 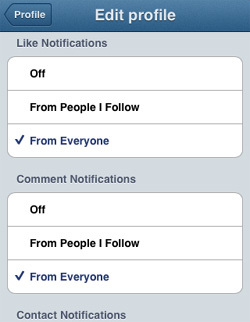 Save yourself time by enabling push notifications from everyone for likes and comments, as well as new followers, Instagram direct activity, and photos of you. You can then scan notifications as they appear on your phone, instead of dedicating a large amount of your precious time to seeking out this information within the app. These notifications will also keep you in the loop on any engagement opportunities, so you can act right away if anything important happens.